It's been quite awhile since I've done a fashion round up post of some of my favorite finds so I figured it was time since fall is around the corner. 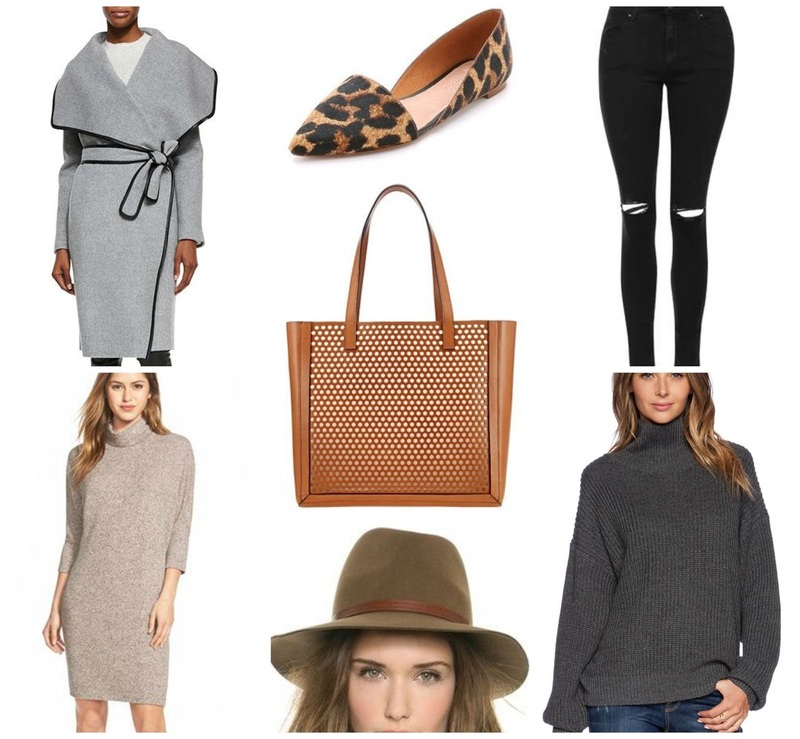 Here are some great basic staples that I would love to add to my closet this year. 1. Vince Wrap Coat - Living in a city that has a brutal winter, coats are a necessity. And because it becomes the entire outfit, I love a coat with some detail. This wrap coat looks super cozy and the leather detail adds a nice touch. 2. Bobeau Cowl Neck Sweater Dress - I live in sweater dresses all winter long. They are so comfortable and are often a blank canvas to dress up with accessories and a great outerwear piece. 3. Madewell Leopard Flats - They are flats that are leopard. Need I say more? Ok, maybe I'll say a tad more. I prefer a pointy toe over a round toe and these would look great with just about anything in my closet. And though they may be a great buy for fall, these are definite year round winners. 4. Loeffler Randall Tote - I am on the hunt for a new tote bag for work and this one from Loeffler Randall seemed fun and different from most of the boring totes I come across. And it comes in black too! 5. Rag & Bone Fedora - In the summer, I love a good straw fedora so in the winter that translates to a wool one. I am not a fan of the huge floppy hats (I mean J. Lo can pull that off, not me) so this brim is just wide enough to give some protection from the wind/cold but not insinuate that the paparazzi should be following me. 6. Topshop moto jeans - I have heard amazing things about Topshop jeans so I definitely plan to pick up a pair this fall. The price point is good and the distressed detailing at the knee is just enough edge for me. 7. Lovers + Friends Sweater - The first thing I start pinning in the fall are big chunky sweaters. This seems oversized but not enough to drown me in wool. And a turtleneck is always my preferred neck style when it comes to sweaters. What are you excited to buy this fall? Have you picked up anything? Let me know if the comments below! There are so many beautiful pieces here! I have been really loving the look of sweater dresses lately too, but it's been tough to find the right length - they're either too long or too short! I agree, that is exactly my autumn list essentials!! Unfortunately, I don't have most of them, I better start searching the stores! Such a cool post!